Hi everyone! 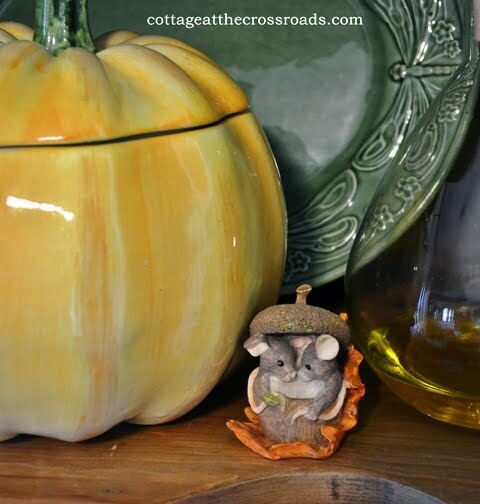 I’ve been doing a little decorating for fall around the cottage. This is a sofa table that sits behind the love seat in our living room. 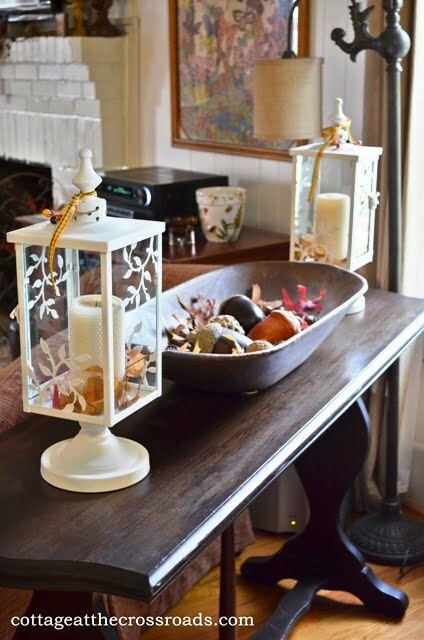 I used the same white lanterns that I used in our summer mantel on the table. I just changed them up for fall by adding a little ribbon, some artificial berries and leaves. The dough tray got loaded up with artificial acorns of all different sizes. Have I ever told you the story of how I acquired this dough tray? Well, it originally belonged to a gentleman friend of my mother. It was his mother’s dough tray, and he remembered her making biscuit dough in it every morning when he was young. He told me that his children didn’t care for old things so he gave it to me because he knew I’d take care of it. I have now had it for at least 20 years and I do treasure it. 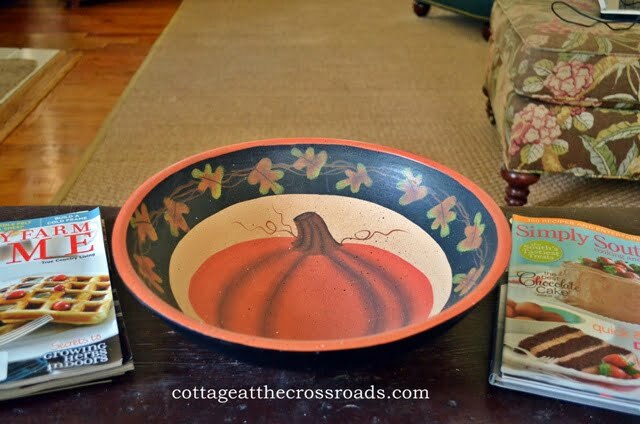 This pumpkin decorated bowl resides on the coffee table in the den. 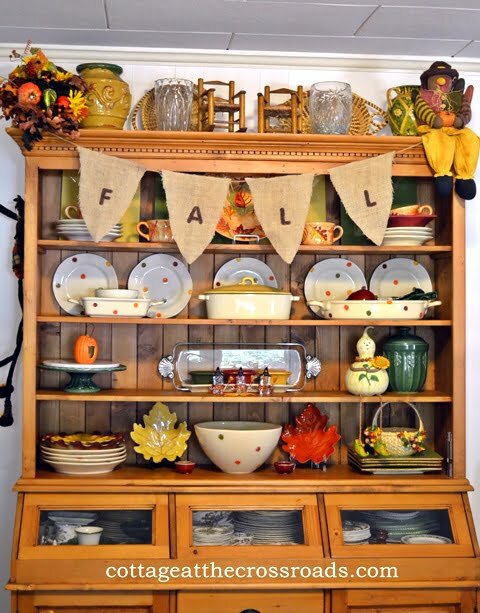 In the dining room the corner cabinet is dressed for fall. Here’s a little closeup of what’s sitting on one shelf. 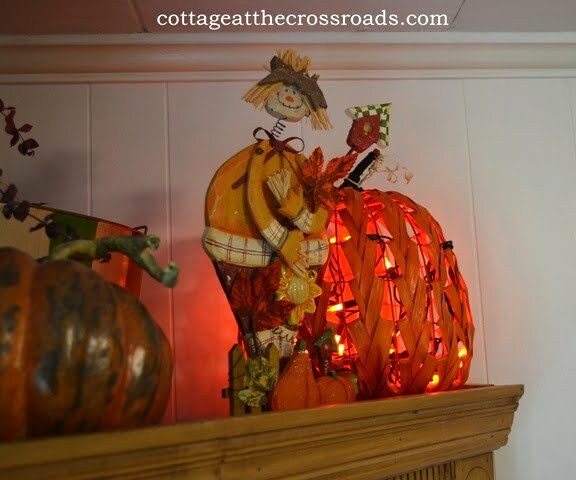 This scarecrow and lighted pumpkin is on top of the corner cabinet. Have I told you that I love scarecrows? On the opposite side of the dining room is our cupboard. I strung the bunting that I used on last year’s fall mantel along the top of the cupboard and added some other fall decorations. More scarecrows are on a shelf of the cupboard. 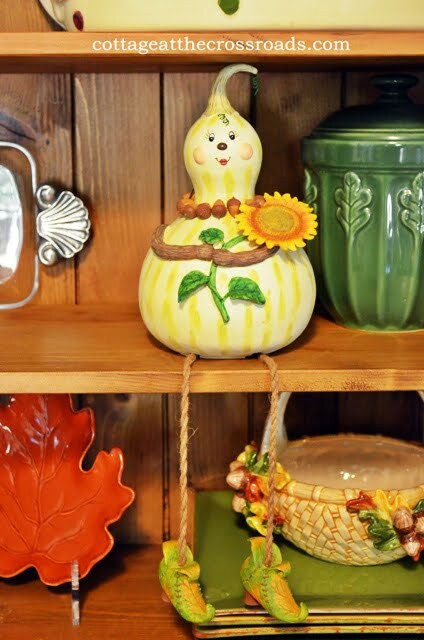 I always love to see my gourd lady each fall. Just look at her shoes! 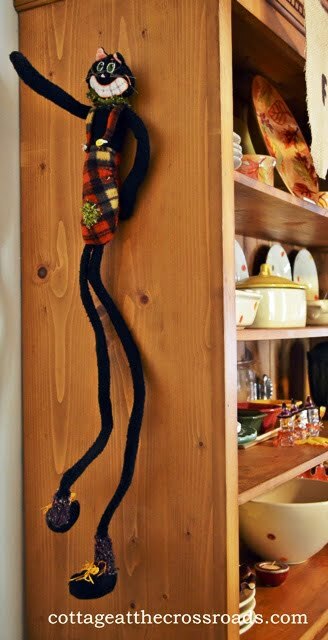 The side of the cupboard is a great place to hang this cat with the loooooong, skinny legs. Our house has two large dividers that separate the dining room from the living room. Here’s one vignette on top one of the dividers. This black cat dressed for Halloween was on a shelf, but I pulled her up to the top to photograph her. She’s carrying a pumpkin purse! And I hope you find this one to be as bewitching as I find her! We’ve already decorated the front porch for fall, and the mantel has been done for a few weeks. Now the only thing we have left to do in order to finish decorating the cottage for fall is to make our annual scarecrow display in our flower garden. Jane, I love your fall decorating. It is beautiful!! 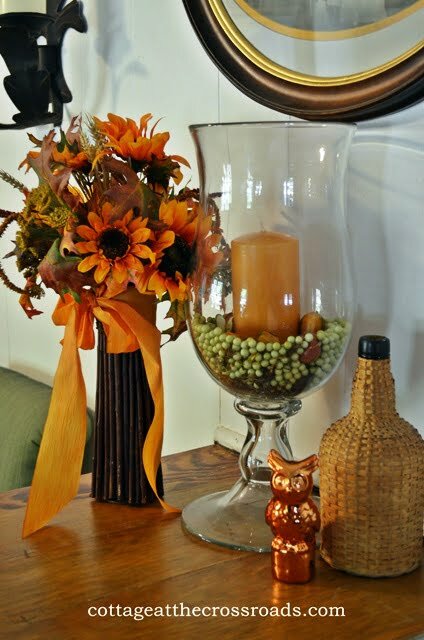 I am going to include a link to this from my blog post on fall decorating, if that is okay. I am so happy to find you! I’ve been searching for months for the Gourd Lady with string legs and those crazy shoes. My daughter gave me this for my birthday several years ago, and I have tried so hard to find the name of it and the company it comes from, as the sticker label that was on it has fallen off and there is no engraved identification on it. 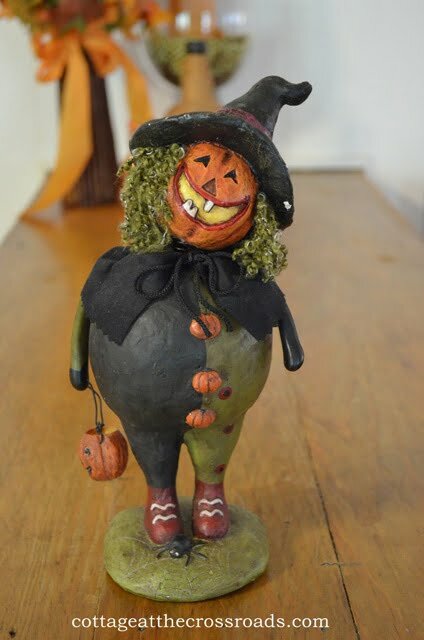 I know they made several different gourd ladies, and I’d like to find them. My daughter bought mine at the gift shop at the hospital where she worked, but they don’t carry them anymore, and no one who works there now knows anything about them. I’m hoping you might know the maker of this lovely lady and can share it! Thanks so much for posting this, and I’ll be following your blog! Your cottage is gorgeous… a place we’d all like to find ourselves! 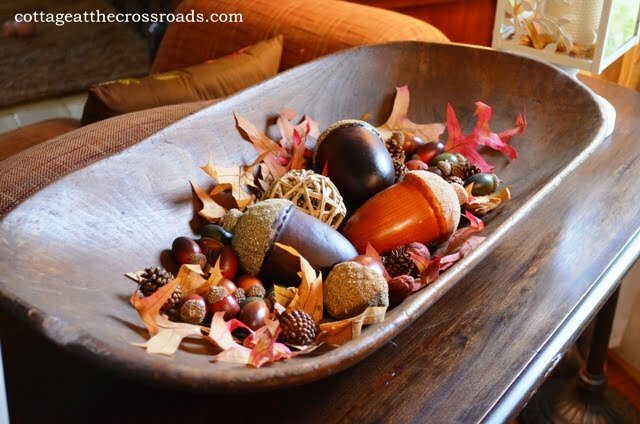 Such pretty touches of Fall around your home, Jane. 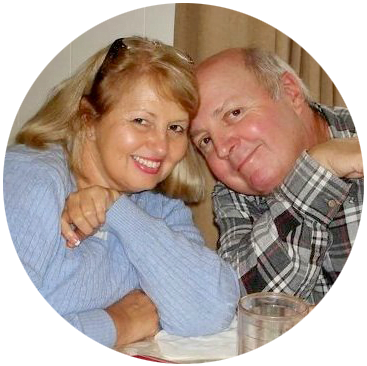 Love the story about how you aquired your dough bowl – what a treasure! It was such a pleasure to finally meet you and Leo at the conference. Thank you so much for helping to make the conference such a success! Jane, Your Fall decorations are so pretty. I love your dough bowl. It’s such a nice shape and looks wonderful with the filler you chose. Don’t you love knowing how people acquire things in their homes? I do. 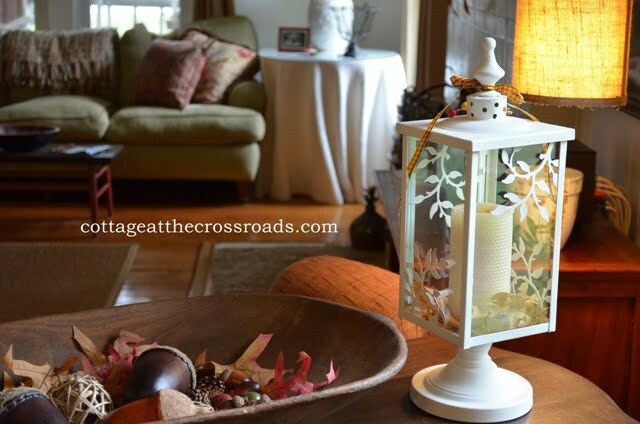 Great vignette with it and the lanterns. Your decorations are wonderful. All of the areas shown are very warm and welcoming. Oh, I just adore all of your special Fall & Halloween decor touches, Jane! 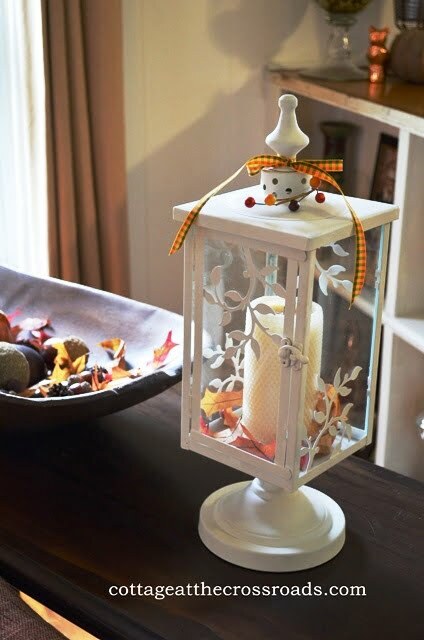 The white lanterns are so pretty & perfect to deck out for any season. The dough tray is lovely and what a wonderful story behind it. It all just looks so fun and inviting — all ready to sit and sip a cup of hot cider! It was great taking a look around at all your fall decorations! 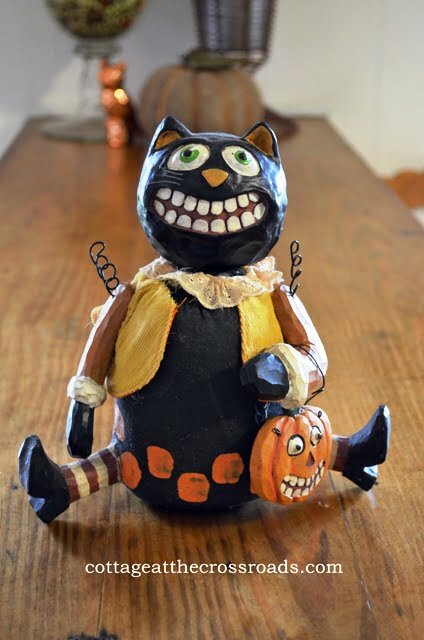 I love the long black cat and the old pumpkin witch hag with her cute smile! Great fall decorations Jane! I love the dough tray and the fact that he knew 20 years ago that you were a good keeper of it! So pretty Jane! Love your scarecrows. You’ve done a fabulous job! The dough bowl is wonderful! I have only seen them on blogs, never in real life. I wonder if it is a Southern thing? Your place looks great all decked out for Fall! Pretty lanterns! Oh good heavens your dough bowl is fabulous. I didn’t know you had one and how cool that it’s definitely the real deal. 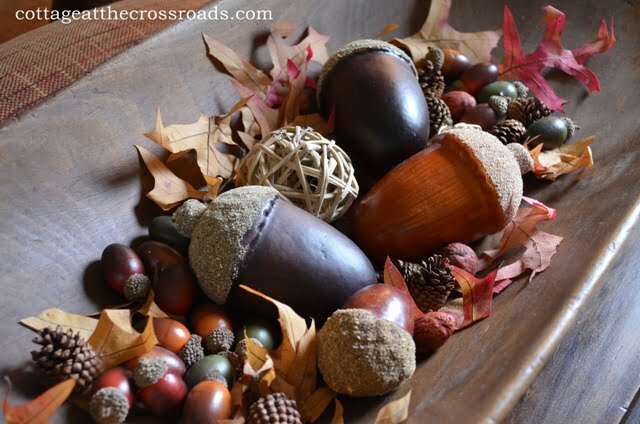 Love all of your fall touches…especially the banner and the big acorns! Hey Jane! Love that dough bowl. Been looking for one at a reasonable price. Love the little squirrels and that pretty little copper owl! Thanks for sharing your beautiful decorations. Enjoy this beautiful weather!!!!! Everything looks beautiful, Jane. 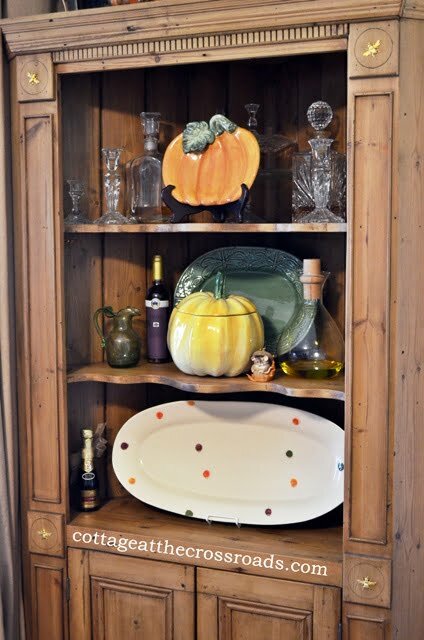 I love your cupboard… what a fun piece for seasonal decorating. But my favorite is your dough bowl. It’s gorgeous! Love the folkart Halloween figurines at the end of the post. Also the ice cube scarecrows. (they must be from Minnesota. Down to 16 degrees last night!). I am envious of your great dough bowl. Great look with the leaves and acorns. 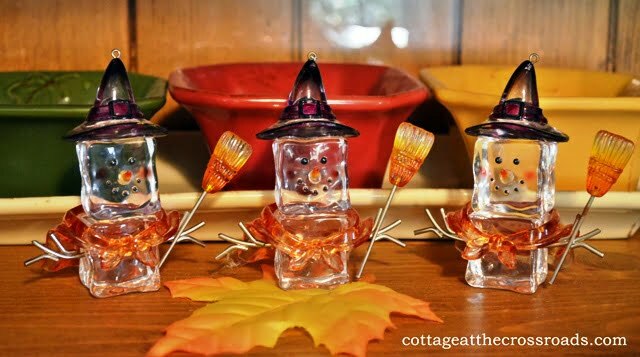 Those fall-colored items are beautiful- I have the same 3 bowl set in front of the ice cube scarecrows. Your wooden cabinets /cupboards are fabulous. Have you ever considered having a scarecrow making party with your granddaughters? It might be a fun memory for them since you love scarecrows. I love your dining room. I am sitting with the windows thrown opened enjoying some nice Fall weather. I love that cupboard in the dining room Jane. It is well appointed for fall. Your dough bowl is a treasure and your friend did good entrusting it to you. It is all wonderful Jane. I love the dough bowl!